Like last year, I just wanted to add a few thoughts in closing now that Women in SF&F Month is over (don’t worry, I promise this won’t be as long as last year’s final post!). First, I want to say a big thank you to everyone who participated in this past month’s event! I had such a great time reading all the articles and recommendations, and I now don’t think I will ever run out of books to read (not that I was really in danger of that anyway!). Also, a big thank you to John for making graphics last month and for helping me set up the text and images in posts, especially during the 2 weeks of April I was really sick. We’ve still got the list of favorite books by women that Renay is working on coming up. Thank you to everyone who contributed some of their favorites! There was a bigger response than anticipated so it is going to take longer to put together than expected, but the fact that so many books were added to the list is AWESOME! I am so excited to see it. I think if there was a theme that kept coming up this past month, it’s that the conversation about women writing science fiction and fantasy is nothing new even though women writing SFF is not new. Frankenstein, considered the first science fiction book, was written by Mary Shelley. Sherwood Smith discussed women’s involvement in fandom and the great number of women attending SFF conventions along with her in the 1970s. Patricia McKillip expressed her delight at the sheer volume of women in SFF—both as authors and characters—by the middle of the 1980s after growing up mostly reading books by and about men. Yet, even today, there are still comments that women don’t write science fiction or fantasy or that women are not interested in science fiction and fantasy, which is simply not true. Both this April and last we’ve heard from several women who are writing science fiction and fantasy or are blogging about science fiction and fantasy (or doing both since the two are not mutually exclusive and many writers began as fans as Sherwood Smith noted!). And that’s just the tip of the iceberg that is female fandom in speculative fiction. Juliet McKenna wrote a thorough analysis of the inequality of the visibility of women writing science fiction and fantasy, and I’d like to refer you to that if you haven’t read it already since it is a very detailed look at the situation from the statistics on frequency of reviews of women’s books when compared to men’s to the circular nature of increased visibility for books by men (such as bookstore employees who are not familiar with SFF finding lists online dominated by men and making prominent bookstore displays composed of only SFF books by men). While there certainly are some who deliberately avoid SFF written by women, there are also a lot of people who just read the books they are recommended by friends. If they’re not told about great books by women, they’re not going to be able to read great books by women and tell their own friends in turn to read these books. Heidi gave an example of this in her guest post. She was shocked to find out her boyfriend didn’t read books by women, but she learned he wasn’t intentionally avoiding them, he just didn’t know about books written by female science fiction authors until she gave him one to read. 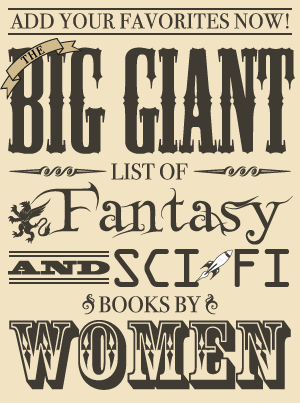 I’ve talked before about it being so important to me to read and recommend SFF by women because I realized I wasn’t reading very many of them when I saw them mentioned, and I found all the names that jumped to my mind first were male authors and it was harder to think of books by women. I knew of women, but not as many, and their names were whispered while the men’s were often shouted. As Kate Elliott noted, it’s important to keep speaking up about the amazing women whose work we do read. There are many women writing science fiction and fantasy books that have inspired others to become fans of SFF or writers of SFF. It’s sad that there are still comments about women not writing or being interested in SFF, and I’m always glad when I see others discussing the women who write SFF they love. Harry Markov spent April sharing some women in genre who have inspired him personally. Kari Sperring started the #Womentoread tag on Twitter to spread the word about books by women that we love. By shouting their names, hopefully someday there will no longer be amazement at the very thought of women being a big part of the SFF world. Finally, I do want to address the response to one of the posts that went up toward the end of the month. I have said since it began that one of the biggest reasons I put in the work of hosting Women in SF&F Month is because I want to have a place where interesting people can come together and talk about the great things they do in the SF&F world. Their perspectives vary, but Sarah’s post in particular seems to have set off an energetic response. I would point out two things on that post. First, it is part of a spectrum of experiences and – while it may have been more bluntly stated than other posts here and around the blogosphere – aspects of her argument are being made by many people in many places. That she disagrees with other people I have hosted this month is not reason to silence her. Second, when a post with a different take on things appears, how is the community to respond? My hope, with everything that I’ve hosted this month, is that it would be seen as an opportunity to have a productive discussion about the differences in the perspectives. The goal of the month is not to create an echo chamber in which we all hold and reinforce the same opinions, the goal is to show that there are women out there doing interesting things that are often overlooked. Some of them will disagree with each other about the larger issues faced by women in SF&F, but when that happens I think we can still talk about the good work to be done. Except in extreme circumstances, I don’t moderate comments for the same reason that I don’t moderate posts, but the danger of that is that sometimes what starts out as a good discussion will get rough. In this case it did, which was not my goal but was bound to happen eventually. I take the fact that it happened once in 60-odd posts about an emotional issue as a very good sign indeed and can only hope that my friends and allies across the blogosphere will understand the value I put on allowing people to speak their mind. One argument does not cancel out the many great discussions that have appeared throughout the month. Women in SF&F Month has been a great experience for the last two years. If I saw a collection of essays with names on the cover like Lois McMaster Bujold, Jacqueline Carey, Patricia McKillip, Nancy Kress, Elizabeth Bear, N.K. Jemisin, Carol Berg, and the many other authors who have stopped by I’m pretty sure it would be an insta-buy for me. I’m looking forward to hearing from even more great authors and bloggers next year, and I hope you’ll come back to read them with me! Oh, and you can stick around in between as well, I do do this whole review and commentary thing myself the rest of the year!